Father and son team, Merv and Geoff Johnston bring over 30 years of experience to their valued customers in Lumby BC and the surrounding Okanagan Valley. Specializing in Hardi Plank and Acrylic siding, the T&G Siding team is pleased to include metal roofing installations, sundeck builds and exterior house painting to the list of construction services they offer to the community. If you have a custom project you need to build, give T&G Siding a call and they will put their experience to work for you. Merv and Geoff focus on high quality craftsmanship and keep the lines of communication open throughout the entire building phase. Their goal is to stay on budget and finish renovations on time, and these results show in the positive feedback they receive from satisfied customers and the growth of their business. T&G Siding is looking forward to providing quality workmanship to the great people of the Okanagan area for years to come. If you need a renovation contractor to finish your project on time and within budget, give T&G Siding a call. HardiePlank siding is our most popular brand of siding, with primed or baked-on colours. With natural looking textures and technical qualities that protect your home’s exterior, HardiePlank may be your best choice. HardiePlank siding is more durable than most traditional masonry products. 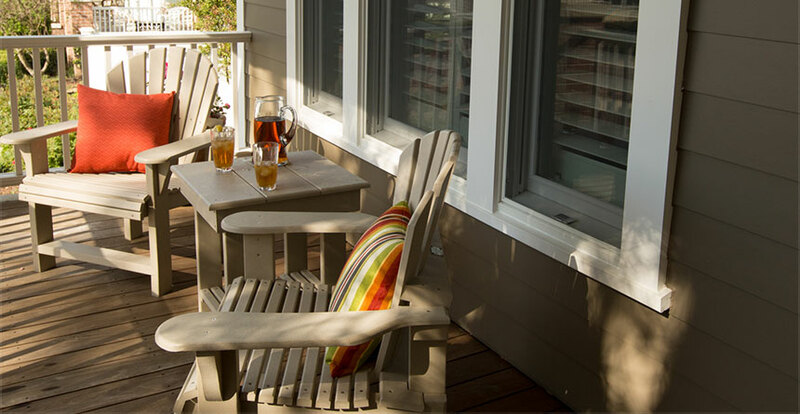 Wood siding has a tendency to buckle and crack when exposed to humidity over time, but HardiePlank siding is engineered to withstand damage from moisture and rot through any season. HardiePlank lap siding is endorsed by firefighters nationwide because of the technical qualities that make it resistant to fire and heat. Performing over time better than wood, vinyl and other masonry products, HardiePlank siding protects your estate value and maintains curb appeal. The application of new HardiePlank siding can boost the curb appeal of your house with stunning new colours and design choices. The natural cedar texture is a great choice for historic and country homes, and unlike wood siding, HardiePlank siding is not susceptible to bird and insect damage. The vinyl siding of today is made with high-tech plastic and vinyl combined with modern manufacturing techniques. We use vinyl siding material that does not crack or sag, and is exceptionally versatile and high-performing for cladding applications. Vinyl siding is cost effective and comes in hundreds of colours and textures. If you are looking for an inexpensive siding option made to withstand our harsh winters, and the heat of mid-summer, vinyl siding may be your best choice. Vinyl siding is virtually maintenance free, and cuts home heating and cooling costs because it is insulated, preventing energy loss between the wall studs in exterior walls. Why metal? Metal roofing adds long term value to your largest investment – your home. Metal can be installed directly over your old asphalt shingles, and is almost maintenance free. Metal roofing comes with superior warranties, are fire resistant and excellent insulators. The new metal roofing material of today comes in a broad range of colours and designs that resemble wood shakes, slate, shingles or clay tiles. A high-quality metal roof will likely be the last roof you will ever need for your home. We would love to work with you on your new renovations, metal roof installation and home remodeling. © 2019 InfoTelMultimedia.ca - InfoTel.ca - T & G Siding - All Rights Reserved. View our InfoTel.ca listing under Renovation Contractors for Vernon.